PokerStars are about to announced that Irish online Poker sensation, j.thaddeus, has just been signed up as one of their UK and Ireland pro’s. Information on the details are scarce at the minute as PokerStars have yet to announce it. However, PokerNewsBoy.com have an inside source that can confirm that j.thaddeus, or Jude Ainsworth which he goes by when he is not online, will be confirmed later this week. 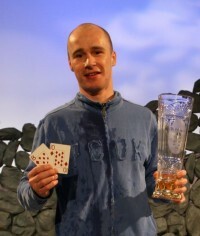 Jude Ainsworth ‘j.thaddeus‘ is a well known name in the UK, and one of if not the biggest name among online players from Ireland. His biggest live result came when he won the €2,000 No Limit Hold’em Irish Poker Championships and picked up $212,000 for his troubles. However, where j.thaddeus really shines is online, where on PokerStars alone he has over $1.8m in online winnings. His biggest result to date was when he picked up PokerStars most prestegious title as the SCOOP High Stakes Main Event winner, picking up close to $1m. So with Jude being one of the best online poker players in the world, also the fact he is from Ireland, and PokerStars just about to launch the UK and Ireland Poker Tour in Galway. It comes as no real suprise that PokerStars have just signed him up. Poker Tip: If your looking to follow one of the best up and coming MTT players. Check out Mully_85‘s Poker Blog. This entry was posted on Wednesday, November 4th, 2009 at 5:26 pm and is filed under Poker News. You can follow any responses to this entry through the RSS 2.0 feed. You can leave a response, or trackback from your own site.